Things are heating up in the Robert Mueller investigation as more and more of Donald Trump’s cronies are being indicted or flipping on the orange haired man child. The list keeps growing of people close to Trump who are being exposed for corruption. The list includes: Paul Manafort, Trump’s former campaign chairman; Michael Flynn, Trump’s former National Security Advisor; Rick Gates, former business partner of Manafort; and Michael Cohen, Trump’s former lawyer and ‘fixer’. One of Trump’s former campaign advisors, George Papadopoulos, just received a puny 14 day sentence for lying to the FBI. In addition to these crooks, there is also one of the first GOP congressmen to support Trump, New York’s Chris Collins, who’s been indicted on insider trading and California’s Duncan Hunter, who is accused along with his wife (who he promptly blamed completely) of misusing campaign funds. Throw in corrupt former EPA chief Scott Pruitt, former HHS Secretary Tom Price, Donald Trump Jr., who may be implicated because of his Trump Tower meeting and of course, Rudy Giuliani, Trump’s current lawyer who looks like he came straight out of a mafia movie and has done nothing but constantly lie and embarrass himself since he was hired by Trump. It’s a rogue’s gallery of con artists who could have easily rubbed elbows with the likes of Capone against the FBI G-men in the 1920s and 30s. Hey, whaddya’ know…Trump is fighting against the FBI just like those hoodlums. The indictments are now prompting America’s CEO/Dictator to become unglued. He has accused Attorney Confederate General Jefferson Beauregard Sessions III of hurting Republican chances in the midterms. He continues his assault on the free press stating that it is the ‘enemy of the people’. Bob Woodward’s new book release paints a pretty dismal picture of the Trump White House and has Trump champing at the bit. Now the orange megalomaniac is blowing his top with his own staff because of a recent op-ed piece in the New York Times which pretty much states that Trump is an addle-brained lunatic incapable of making sound decisions. So, logically with all this mounting evidence of a completely incompetent and dangerous administration, why aren’t the supposedly ‘morally superior’ Republicans removing the orange haired man child from office? Like we’ve said in previous posts, the Trump administration is doing exactly what the Republican’s corporate overlords want him to do; provide daily distractions in the media while the Republican corporate lackeys in the Senate, House and the courts systematically dismantle laws and regulations therefore enabling the corporate oligarchy to reap enormous wealth in the process. If that means breaking the law, then so be it. The Republican party is no longer a party; their actions indicate they are now a crime syndicate worthy of praise from the Godfather himself. 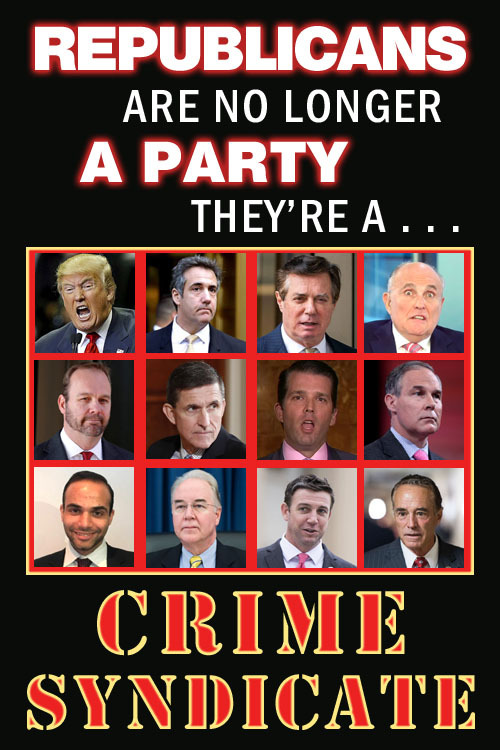 With so many indictments of Donald Trump’s associates, twenty-first century Republicans can no longer call themselves a party; they’re a crime syndicate.